Are you a conscious, heart-centered entrepreneur, expert, coach, author, speaker, author or healer who is soooo over feeling "website shame?" Finally! A simple, powerful, step–by–step method to transform your website into one you absolutely LOVE and that LOVES YOU BACK! You CAN learn exactly what it takes to build a website that is totally in alignment with your business, your mission, and your values. I’ll show you how – so you can reach more people, get your gifts out into the world in a bigger way AND start making more money! You have a website…but you don’t like it. (Plus it’s not doing a thing for you.) You know you’ve outgrown it or you just threw it up to get something up and it doesn’t represent you or your business. You’re embarrassed to give out your url and because of that all your other marketing efforts have slowed to a crawl (because you don’t really want people to actually LOOK at your site). Worst of all, you have NO idea how to fix it. You spent a ton of money on your website…and it’s not doing a thing for you. No leads, no sales, no clients. No nothing. You thought you put up a pretty good website, but you’re not actually selling your products or services and you don’t know why. You’re frustrated. The worst part? Not only are you not growing your business the way you had always dreamed of, but you know you’re not getting your gifts and message out into the world either. And you know in large part this is happening because you have "website shame." If any (or all) of these statements rings true, then you’re in the right place. It’s not your fault your website isn’t attracting the folks you’re meant to reach (not to mention inspiring them to work with you). I get it. You went into business because you have a gift — a message or mission you’re passionate about sharing with the world. But if you’re like so many of the entrepreneurs I talk to, marketing is NOT your specialty. Good news: it IS mine. Before we go any further, let me tell you a little about me. People say I’m one of the hottest copywriters and marketing strategists around, and my client list reads like a Who’s Who of Internet Marketing – it includes names like Lisa Sasevich, Brian Tracy, Ali Brown, Andrea J. Lee, John Assaraf and more. I’m known for writing copy that gets people to buy. But I wasn’t always helping big–name clients achieve their biggest goals. I started off as a freelance copywriter. I was much like many other freelance copywriters, except for one important distinction: I had good instincts. So even though I’d never been trained as a direct response copywriter, I still got some incredible results for my clients (and, just in case you didn’t know, “direct response copywriter” is what they call people like me who write copy that gets results). The problem was, I couldn’t explain what I was doing. Because I hadn’t yet studied direct response copy, I was simply going on instinct. Therefore, I didn’t really understand WHY it worked, I just knew it DID. A few years later, I discovered the whole world of direct response copywriting. Finally, I could see a SYSTEM, a reason WHY things worked. But there was a problem. Even though I now knew how to help my clients attract more clients and make more money (as well as get their work out into the world in a bigger way) a lot of them didn’t like how I did it. They didn’t like the way direct response copy made them feel. So I went on another quest. How could I take what was "good" in direct response copy and transform it so it felt good for the entrepreneur to use and it also felt good to their ideal clients? And that was how my book “Love–Based Copywriting Method: The Philosophy Behind Writing Copy That Attracts, Inspires and Invites” was born. "Wooo hooo! Finally someone is sharing the ins and outs of creating copy that rocks and feels good. Now we can all stop stressing about nailing our marketing and begin having more fun with it…and that’s what attracts our ideal community. This book made me happy!" "What a breath of fresh air! For those like me who resist using fear-based marketing copy, Michele shows us there IS another way’that WORKS! And fear–based marketing isn't it. 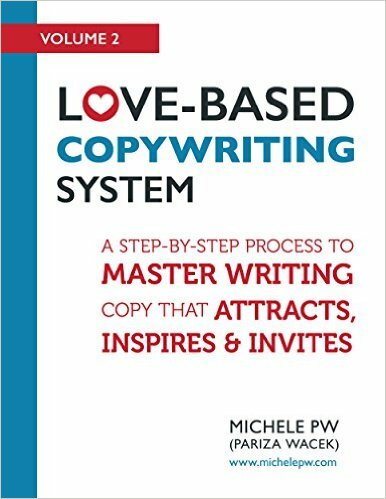 Thanks Michele for an easy read which proves that love-based copyrighting is far more effective for inspiring others to want to take action and become ideal clients!" 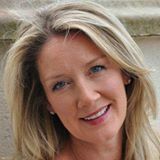 Eva Gregory "America’s Divine Guidance Coach, speaker and author"
"Finally, a book that gives much-needed clarity on how to write sales copy that doesn’t feel like hype. Michele gives the gift of explaining how to write copy from a place of truly caring about serving your ideal client, in a way that not just feels really good to both the writer and the reader, but also elevates your business to long-term success because, as she teaches in this book, the love-based approach wins over fear-based in terms of profits and sustainability every single time. Through the specific examples she gives, it’s very easy to grasp how to start writing love-based copy right away. In fact, as soon as I finished reading, I made some changes to some copy I was in the midst of writing using one of the techniques Michele offers in the book, and got two immediate sales as a result, and I'm sure there's more on the way. If you&rsve been feeling not-great in any way with writing your copy, give yourself the gift of this book and start bringing more of your ideal clients into your community right away." If you like the idea of how love-based copy sounds, then I’d like to invite you to take a closer look at my program: "Love-Based Websites — How to Write a Website That You Love AND That Loves You Back." If you know anything about construction (and even if you know next to nothing), you know you need a strong foundation if you want a house to do what it’s supposed to – provide long–term shelter. Well, the same goes for website creation: if you want your site to attract, inspire and invite your ideal prospects to become ideal clients, you need to build a strong foundation. This is where we cover all the nuts and bolts of your website. The very first step in creating a website you love is to decide how it’s all going to fit together, and what, exactly, it’s going to do for you. How to position what you sell AND write your copy in a love-based way that attracts, inspires and invites your ideal prospects to become ideal clients. If the writing part of marketing makes you cringe (and believe me, I’ve heard this from SO many of my clients! ), then you’re going to love this module. This is where we talk about some of the vital elements of a fabulous website you love – and even more importantly, HOW to write them so your website loves you back (in other words, so you also are attracting, inspiring and inviting your ideal prospects to become ideal clients). 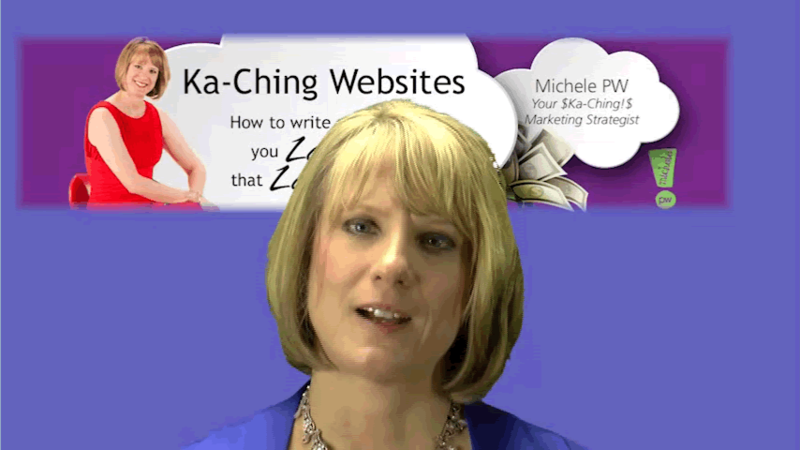 Michele PW’s website course is pure gold! It’s a must have if you want to build a website that converts clients into paying customers. I did the course last year and it was a hugely instrumental in helping me to get very clear about the structure and the content of my website. Michele has a way of identifying what to include and how to weave your uniqueness into the copy, then pulling the content together, so that what for me was a monumental task became all of a sudden straightforward and really do–able. I’m a big fan of Michele’s work anyway because I think she is a very gifted writer and copywriter. Working with somebody with her level of experience and expertise to guide you on the way is a no brainer and if you get a chance to work with her, grab it with both hands and learn from the best. You’ll be glad you did. Yep, you read that correctly: I’m dedicating 2 entire modules on the elements of a website. Why? Because I want to ensure we have enough time to delve deeply into each element so you understand it completely. This knowledge means you’ll be able to put all the elements together on your current website AND any future websites, structuring them so you love them as much as they love you. Finally: we create your site map. Using all the worksheets and exercises you’ve completed in Modules 1–3, we plug your details into my powerful, results–driven site map and copy formulas. Yes, this is plug–and–play at its best — you’ll get a site map template and copy templates — making it super easy to plug in the copy you’ve already created in the previous modules and craft a website you love AND that loves you back! This module includes templates and worksheets and my step–by–step formula to walk you through how to put it all together. In addition, you’re going to learn my secrets on how to write love-based copy, which is copy that feels GOOD to you and attracts, inspires and invites your ideal prospects to become ideal clients. No hypey, arm–twisting language here. You’ll learn how to write copy that gets you results without you feeling uncomfortable. In short, you’re getting absolutely everything you need to design a love-based website that makes you money! From start to finish, from concept to sale (after sale, after sale), you’re going to know exactly what to do, each step of the way. … It seems like a LOT!" First of all, you should know I’m completely committed to your success. It’s my passion and my mission to help as many heart–centered, mission–driven entrepreneurs as possible to achieve marketing success. Why? Because I get to share MY gifts while help you share yours more effectively! To that end, here’s what you get when you join me for Love-Based Website: How to Write a Website You Love AND that Loves You Back! An audio and transcript so you can choose the best way you want access to the material. Exclusive access to a monthly LIVE Q&A call (which takes place the 3rd Tuesday of the month at 1 pm PT/4 pm ET). You’ll have a chance to personally ask me questions, get live coaching plus maybe even get a little critiquing along the way. Exclusive access to a private Facebook group where you can post your questions and get feedback from others in the group as well as myself. Additional resources I’ve designed to help you master this marketing thing – special reports, info sheets and more! You'll also get this very special bonus. Now, you’re probably wondering how much this is going to cost you. Of course – you’re a businessperson, so you know it’s most important to take a good look at the bottom line. First of all, this as an investment, as opposed to a cost. When you invest time and money into creating a website that’s actually designed to be profitable (based on proven systems and formulas), you can count on a huge return on that investment. That being said, $497 seems very reasonable, doesn’t it? And think about it this way: how much has it cost you already, and how much will it continue to cost you, to pour time, energy and money into a website that isn’t bringing sales the way you want it to? How much is it costing you to run a marketing program that requires TONS of effort on your part? Now, how much is it worth to you to have a website working EFFECTIVELY for you, 24/7, so you can focus on doing what you love to do, while enjoying a pipeline full of ideal clients who can’t wait to work with you? Invaluable, right? I think so! The fact is, you CAN have that kind of website. If you already have the skills and the passion to deliver an awesome product or service, all you need is the knowledge to sell it effectively – and that’s exactly what I’m offering you. All you have to do is land ONE new client or sell a couple of $200 products to earn back this investment (and I can tell you, that’s going to happen FAST once your new website is up and running). Creating a website that goes Ka–Ching is one of the best ways to reach more people AND earn more money – more easily than ever before. And that’s exactly what Websites that Go Ka–Ching! How to Write a Website You Love AND that Loves You Back! is all about. Imagine how much easier your life will be when your website is making the sales for you! Plus, you’re protected by my Iron Clad, 100% Satisfaction Guarantee. I am confident you’re going to LOVE what you learn in this program. But if you don’t, you have 90 days to ask for – and receive – a full refund, no questions asked (as long as you attend the calls and do all the work). Below, I’ve included a few of the questions I hear most frequently, and their answers, to help you determine whether this program is a good fit for you. Q: My business is new, and/or I don’t even have a website yet. Can this help me? A: Yes! In fact, it’s better to learn all this fabulous information NOW, rather than later after you’ve put a ton of precious resources into a site that doesn’t get you results. Wouldn’t you like to start your website off on the right foot, fresh out of the gate? Q: My website IS making money, but I think I could get better results. Will your program help me? A: Yes. Chances are you’re doing some things right – otherwise you wouldn’t be making money. But, chances are also good that there are pieces you’re missing, or maybe something you’re not doing as well as you could be. Based on what you learn here, you can supercharge your results. Q: I’ve already hired a web designer and/or copywriter, and they’re going to create a rockin’ site for me. Do I still need this course? A: If you haven’t gone through my Websites course, there’s an excellent chance you’re going to end up with a beautiful site that is also a complete flop. If you don’t have ALL the right elements, in the right places, on your site, you’re NOT going to get results. Make the process easier on your designer/copywriter AND on yourself by learning everything you need to know to create the results you want and deserve. Q: I can’t write at all. Not to mention I hate the idea of writing. Can this course still help me? A: Actually, this is part of why I put course together the way I did. As you learn the different foundational elements of an effective, profitable website, I also provide you with formulas and templates for writing love-based copy that also gets you results (yes, even if you HATE writing). Q: I don’t have a bunch of extra time to spend on my website. Is this really going to be worth my time? A: It’s likely that if you’re overwhelmed with all the other aspects of your business, you’re probably not using your time as efficiently as possible. If you’re like many of my clients, you’re spending a TON of time on marketing or on sales calls (and follow–up calls). Creating an efficient website will SAVE you so much time you might wonder why you didn’t do this sooner! Marketing will become a breeze, and your sales calls will go much more quickly because people who’ve seen your site will know whether you’re a good fit. YES Michele — I’m ready to learn how to craft a Website I love AND that Loves Me Back! An audio and transcript so I can choose the best way I want access to the material. Exclusive access to a monthly LIVE Q&A call (which takes place the 3rd Tuesday of the month at 1 pm PT/4 pm ET). Additional resources to help me master this marketing thing – special reports, info sheets and more! A special LIVE kick-off call on Tuesday, August 26 at 2 pm PT/5 pm ET to help me get started on the right foot. A very special audio and worksheet about crafting my love-based freebie. And I understand I’m making this investment at no risk because I’m covered by your Iron Clad, 100% Money Back Guarantee. That is, I have 90 days to decide if this program is right for me – and if I don’t believe it’s worth the investment, I can write to you for a full refund, no questions asked. * If you choose a payment plan, please note that the payments will be billed at 30 day intervals. Imagine … KNOWING your website is increasing your profits while YOU focus on spreading the message you know you’re meant to share! It IS possible, and your path to profits begins here. P.S. If you’re tired of wondering WHY your website isn’t bringing in the profits you work so hard for, I urge you to invest in this training. You’re going to discover the truth behind a successful, profitable website. And even better: it’s easier and simpler than you think. Click here to reserve your space in this brand new program now. Michele started writing professionally in 1992, working at agencies and on staff as a marketing/communication/writing specialist. In 1998, she started her business as a freelance copywriter. But she quickly realized her vision was bigger than serving her clients as a one-woman-shop. In 2004, she began the transformation to building a copywriting and marketing company. In addition, Michele is also a national speaker and the bestselling author of the “Love-Based Copywriting" books that teach people how to write copy that attracts, inspires and invites. She has also completed two novels.